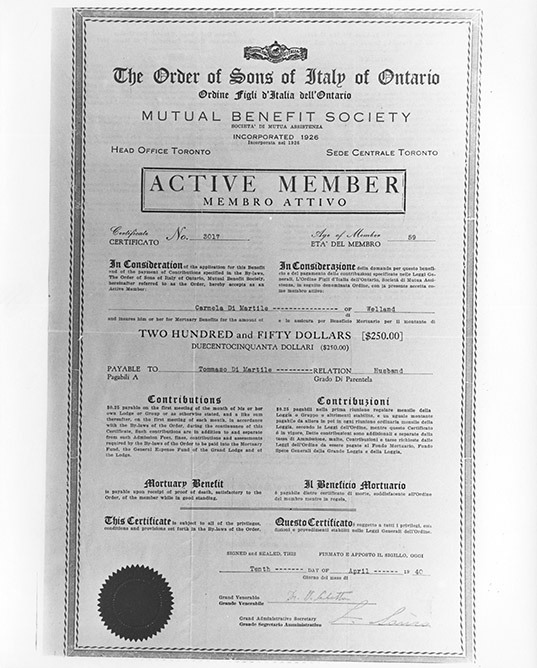 Membership certificate of Carmela Di Martile of Welland, ON, for the Order Sons of Italy, April 10, 1940. The certificate was issued from the head office in Toronto. The Order Sons of Italy (OSI), founded in 1905 by Dr. Vincent Sellaro in New York City, operated as a mutual aid society for those of Italian origin. The first Canadian lodge of this fraternal organization was founded in Sault Ste. Marie in 1915. Fascists attempted to take control of this organization in the 1930s. The document is signed by the Grand Venerable Dr. Vittorio Sabetta and Grand Administrative Secretary Libero Sauro. Both men were arrested and interned as threats to the safety of the Canadian state.